OT: We know and hate that BA add on their Carrier Surcharges to redemption bookings but I have just been seeing what the taxes on a redemption would cost in a ‘perfect world’ using the ITA Matrix and notice that even on a normal cash ticket, BA still add on a Carrier Surcharge of £400. Does anybody know why this is as surely their money comes from the Fare itself? I’m confused, they all do… BA, Virgin, American, Air France – what am I missing/not understanding? AFAIK their carrier surcharges are the same on both award and cash tickets. BA is not alone in adding such surcharges and the reason they do so should be blatantly obvious. BJ – actually not convinced that YQ is constant for a redemption Vs cash fare, if fact in previous examples I’ve seen I’m sure it’s higher for redemptions. Interesting, I will pay attention to them in future and see. Which is why AMEX MR are so valuable so you can trasnfer to Delta / United Etc that dont generally charge the exorbitant carrier fees. You can’t move MR to United or American, so that is 2 of the 3 ways of avoiding fees gone! Yes quite right united. Ive booked on Guarda/Vietnam air/Korean air long haul for next to no fees in the last 12 months through partner redemption’s. All from Amex MR. I guess these must have been through Delta in that case. Does the IDC card allow transfer to either? Wish you could transfer them to United, sadly not an option for UK MR programme. The other name for “Carrier imposed surcharge” is “Carrier Greed Charge”. So far as I understand it, British Airways used to call these amounts ” fuel charge” until someone sued them in the US courts saying cost of fuel had gone down not up and why was British Airways still charging a “fuel surcharge” type thing on every ticket. To their credit British Airways promptly complied and removed the annoying title fuel surcharge AFAIK. However mysteriously we now have a carrier charge, also coded YQ, which has apparently sneakily increased by serious amounts recently without any announcement, instead. OT: Hilton Honors points expiring end of this month. Can I book a room for April onwards (after points expiry) without risk or does the room have to be booked to stay in pre expiry date? The points should be deducted when you make the booking and will reactivate the expiry of your account. You can book now later, no problem. Note that ANY activity resets expiry, so simply moving 200 Amex Membership Rewards points will save you anyway. Hilton Malta posted an offer. 20th February marks the 100 DAY COUNTDOWN to the 100 YEAR ANNIVERSARY of the Hilton Brand! To launch the celebrations we are offering 100 Deluxe Rooms at €100 per room per night including breakfast for 2 persons! That is NOT ALL! When taking up the room offer, you get a 10% DISCOUNT on any Food & Beverage consumed! Possible over optimistic reading into that. OT – If you book an airport hotel and parking package on a third party site (such as Travel Supermarket or Holiday Extras) do you get status benefits and points from the stay? Is it brand dependent? Very unlikely. You might get lucky but you certainly should not rely on it. 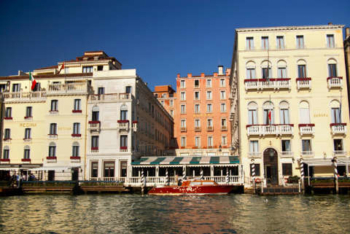 Is the Intercontinental Venice simply not happening? Yes, it is happening but things move slowly in Venice. Something to be keeping an eye on I think. They sued someone – will be interesting to see if they can make it stick. I am sure a good chunk of people book ex-EU with the last leg on a separate day? The problem with Lufthansa is that German Court ruled that no-show policy is unfair and they should remove it from their T&C’s. Now Lufthansa is happy if you do not fly any of the segments, but they specifically state that they will reprice the fare. That’s what happens with this customer… he didn’t fly the last leg, and his ticket got repriced. Lufthansa lost the first case, but it has decided to appeal. Interesting times ahead. OT, just arrived from AirEuropa, 20% off Tourist (economy???) fares using the code ‘LOVE20’ on the payment page. AirEuropa are interesting because they fly a wide bodied aircraft on some of their routes out of the UK. 20% web discount code applied on fare on all our Tourist class. Not applicable on Business class. For sales from 11/02/19 to 14/02/19. Travel period: 11/02/19 – 14/06/19, except for 12/04/19 – 22/04/19. Not applicable on Spanish interisland routes. Only applicable to Air Europa operated flights. O/T Just been hit with a 12 euro Irish Independent bill..Those who signed up for the Avios remember to cancel! O/T got a “late payment forfeit” of 10 amex points on my amex statement. What’s that all about? Had paid off the amex charge card and no monetary penalty on statement. Ring them to find out. OT: I know Amex to Delta transfers are instant once accounts are linked. How fast are they if accounts are not linked and it’s a first transfer from MR to Delta? Try a different browser. The submit button didn’t work for me either in safari. Charge from point account approved then annually on anniversary statement. Sorry, that was so concise as to be unhelpful. – card issued maybe 5 or 6 Feb and window to hit target spend begins at that point. This can actually be before you physically have the card, they take about 5 days to arrive IME. – subsequent annual fees would be on anniversary statement dated 6 March 2020 etc etc.. If you take a while to activate the card, it doesn’t change any of this, so you might as well get onto it. The charge is on the first statement. The 3 month time period to put the spend through fur the bonus starts from day of approval, whether you activate or not. Try putting date in as “dd mmm yyyy” format eg 04 JAN 2019. Has just taken me 2 weeks to get an unsatisfactory response to booking.com only tracking 1 of 2 transactions.